The latest 'game-changing' fly rod from Orvis - made in the USA. It’s hard not to get jaded with all the news of the “latest” and “best ever” new kit that is heralded each season by the manufacturers but once in a while you really have to sit up and take notice of the hyperbole and check an item out to see if it really lives up to what you have heard or read. 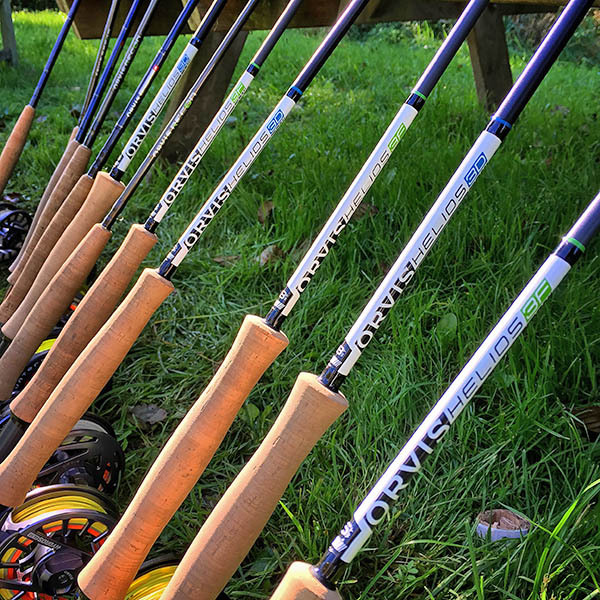 Such was the case with the Orvis Helios 3 last week when I had the opportunity to meet up with a group of invited fly fishing bloggers and journalists at Orvis’s Timsbury 5 beat of the Test to have a first-hand play with this much-talked about new rod. Choose your weapon! The white logo section on the H3 certainly stands out – you will know when you see one on the water and that is the point. The buzzword around the H3 is accuracy – that anyone can throw straighter and truer with this rod and I have to say I was markedly impressed immediately from my first couple of casts. It’s hard to explain without experiencing it for yourself, but the strategically reinforced blank that serves to deliver the (warning – hyperbole alert!) “most significant reduction in horizontal and vertical tip frequency ever conceived” really does make a difference that I could feel straight away. At the end of the cast there is just no feeling of wobble or tip vibration and it feels good. Sure enough I did find that my casts were flying truer to the target I was visualising and with less effort – and as I have said in previous reviews, I am not the world’s greatest caster by any means, just someone who has fished a long time like many of you and so can notice a difference if there is one to be observed. 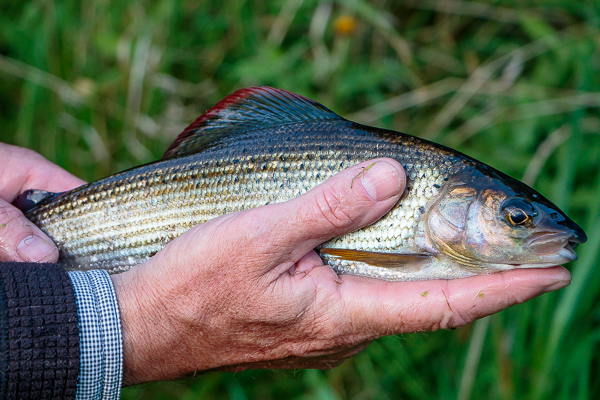 Grayling from a River Test carrier. Well we had to have a few casts with the rods! There are some other more subtle design points worth noting as well such as the rod AFTM designation being displayed visibly on top of the rod blank just above the handle (see photo above) so you can see it easily when it is sitting in a rod rack. The rod also has a new quick-thread on the reel seat which with just one spin of the collar moves it from the bottom of the thread all the way next to the reel leaving you only having to tighten it. A small thing maybe but a very neat piece of design and a time-saver. Obviously as this is a top of the line product it therefore arrives with a top of the line price – between £800 and £900, so watch out for those car doors and ceiling fans! They are available via the Orvis UK website in #5 and #8 currently with more models to follow soon, and stocks are beginning to arrive in their stores around the country as well as other fly fishing retail outlets, so I encourage you go to and try one out for yourself and see what you think.